Measuring instrument which checks the qualities of a FI switch. 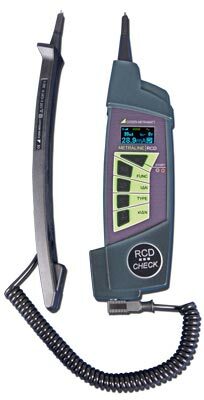 It is all about the measuring of the contact voltage in particular, determing time and tripping current of RCD types A, AC, S and F.
Measurement of touch voltage without tripping the RCCB. Contact voltage is measured with reference to nominal residual current using 1/3 of the nominal residual current value.